This is a Simple Wallpaper Manager that allows you to select image files from a location on your computer and build saveable lists of local wallpaper image files that can then be loaded in to the application to save browse time. Automatic wallpaper cycle allows you to configure automatic wallpaper change every hour, daily, weekly, or monthly. 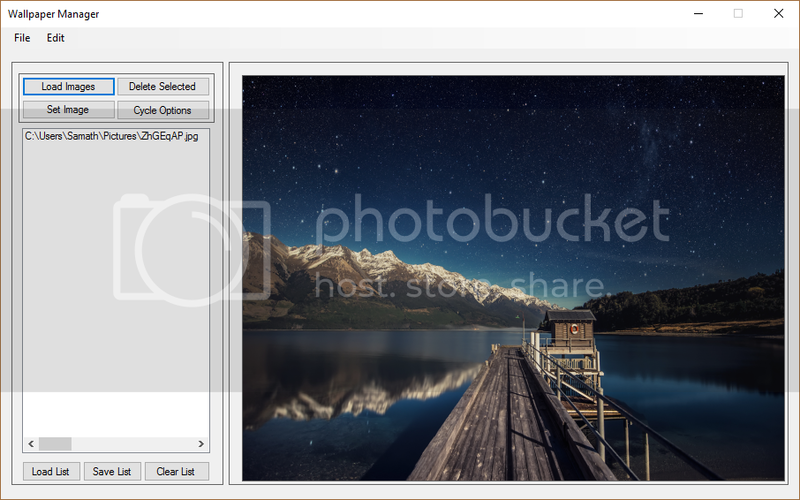 'Select our wallpaper image files for list and preview images. 'Manually cycle through list previews. 'Remove selected image files from list. 'Declarations for wallpaper set procedure. 'Assign list data from list generated in FormMain. 'Declare registry section to be edited for wallpaper size mode. 'Check to verify a size mode has been selected. If false, alert user and exit code sub. 'If true, edit registry keys for selected size mode and run wallpaper set procedure.